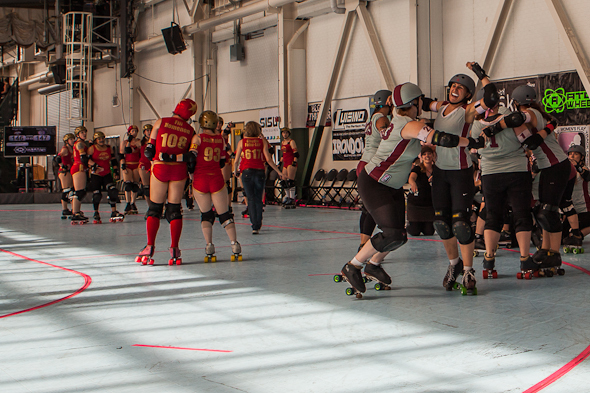 Was there any doubt that the bout between Angel City Derby Girls and the Sacred City Derby Girls was the greatest match of the 2012 Women’s Flat Track Derby Association Western Regional Tournament? The two teams are bitter sweet rivals with a relatively long history. When the bout ended, Angel City’s tournament MVP Jammer Fifi Nomenon fell to the track one point short of Sacred City, but many fans thought Angel City won. The two teams fought, pushed, skated, and tugged the entire game. When Sacred City eventually won, players from both teams cried. Players from other teams cheered. I love close games and I would watch these two teams compete every day. I also wish my children had attended so my son and daughter could have watched how the players respected each other despite the fierce competition. Despite losing an agonizing bout, Angel City congratulated their rivals. Sacred City celebrated without being arrogant. In roller derby, the players often assume outrageous identities, but the people behind the personas know how to be human when it matters. In case the slideshow link does not appear on your browser…. If you wish to read more about the game, visit the WFTDA blog. There are game recaps for all 17 Western Region Games and links to other sites. This entry was posted on Thursday, September 27th, 2012 at 11:58 am. It is filed under Journalism and News, Roller Derby and tagged with Angel City Derby Girls, Roller Derby, Sacred City Derby Girls. You can follow any responses to this entry through the RSS 2.0 feed.